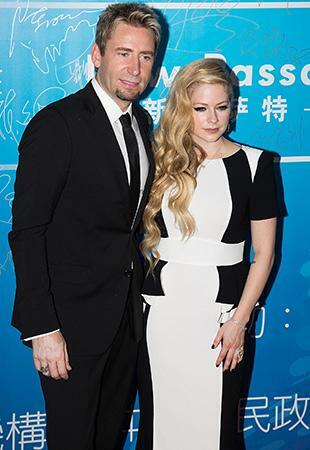 Call it serendipity: China's Huading Awards has given Canadian pop star Avril Lavigne the title of Best Global Singer on the same day that she and husband Chad Kroeger dropped their latest duet -- which, ironically, is getting some of the worst reviews ever. On Monday, the Canadian couple walked the red carpet at the 10th Huading Awards in Macau, China, in coordinated black-and-white outfits. Lavigne arrived with her hubby in tow to accept her award for Best Global Singer in a gown by Brian Rennie for Basler. "I love all of my fans in Asia. You have been so good to me over here," Lavigne said on the podium. The same day, the 29-year-old Ontario native was also celebrating the release of "Let Me Go," the latest single from her self-titled fifth studio album, which features her husband. It is one of 10 songs co-written by Kroeger on the 13-song album, which is due out Nov. 5. Unfortunately, the piano ballad, which is firmly positioned between a Lavigne pop confection and a Nickelback rock anthem, is not being particularly embraced by critics. Buzzfeed wrote a review titled "Chad Kroeger And Avril Lavigne Made A Duet Together And It’s Just As Horrible As You’d Imagine." Feminist website Jezebel echoed the sentiment, headlining their piece on the subject "The Avril Lavigne/Chad Kroeger Duet Is As Terrible As You'd Expect." MTV's Buzzworthy Blog, meanwhile, was slightly less superlative: "Avril Lavigne + Chad Kroeger's 'Let Me Go' Is Like The Relationship Therapist We're Too Cheap To Pay For." Set to be released on iTunes on Tuesday, the tune was in fact penned last March, on the first day Lavigne and Kroeger started working together in the studio, where they eventually fell in love. "It was about letting go of someone and having them let go of you," Lavigne recently told Yahoo Music of the song. She and the Kroeger became a couple in July 2012 and were married a year later. By that time, they had changed "Let Me Go" to reflect their relationship. "We rewrote the last chorus to put a twist on it so we end up together," she told Yahoo. "Therefore, the message of the song is more the journey of love through one's life."